At one point during Wednesday's game against Southeastern at Johnson Hall, Kirkwood women's basketball coach Kim Muhl turned to his bench looking for players. The No. 2 Eagles already had four players sitting in street clothes. When Muhl turned, one player was getting checked out by a trainer and yet another had run to the locker room area not feeling well. "We got a couple of kids sick and we got a couple of kids (banged up)," Muhl said. "We're holding it together with a Band-Aid right now." Still, the Eagles found a way to win. They jumped to an early 12-0 lead only to see the visitors cut the margin to one in the third quarter before pulling away for a 63-44 ICCAC triumph. "It was a tough team win," said the veteran Kirkwood coach. "I think the kids gutted it out. It was just one of those things where you have to tough it out." Kirkwood (20-5, 10-0) won for the ninth straight time, but did it without starters Ashley Tull and Haley Mullinnix. Tull, Kirkwood's leading scorer at just over 10 points per game, is out for the season after tearing her ACL in the Eagles' earlier win over the Blackhawks on Jan 17. Mullinnix, who has played some of her best basketball over the past couple of weeks, was injured in last Saturday's win over Little Priest. Muhl did not elaborate on the severity of her injury, saying he hoped she would be able to play in Saturday's road game against No. 5 NIACC. With two starters missing, Muhl had to alter his rotations, forcing some to play different positions and extended minutes. "It's kind of different when you have different rotations, looking to see who can go where" he said. "It's a challenge right now, but that's the way it is and we just have to deal with it." Sophomore Anasha Hurst was a calming influence for the Eagles in the second half. The 5-foot-8 St. Louis native scored 12 of her 14 points after halftime and was strong on the defensive end, coming up with three steals. She finished with a double-double, grabbing 10 rebounds while logging 37 minutes. Freshman Paige Bradford also got extended minutes. She scored 10 of Kirkwood's first 12 points and finished with a game-high 17 points and also grabbed 13 rebounds. "Anasha had a fantastic second half," Muhl said. "Paige played more minutes tonight and she got a little tired. It's hard when you play (29) minutes and you are used to playing 16." The biggest shot of the night likely came from reserve Jheda Kennedy, whose 3-point basket to end the third quarter pushed the Eagle lead back to 49-40. Kirkwood's defense took over in the fourth quarter, holding the visitors to just four points. "Jheda's basket gave us a little breathing room," Muhl said. "I thought we guarded better and gave them only one shot instead of two or three shots in the fourth quarter." Mackenzie Jenkins added 11 points for the Eagles. Mrylena Stewart led SCC (15-9, 5-5) with 15 points off the bench. 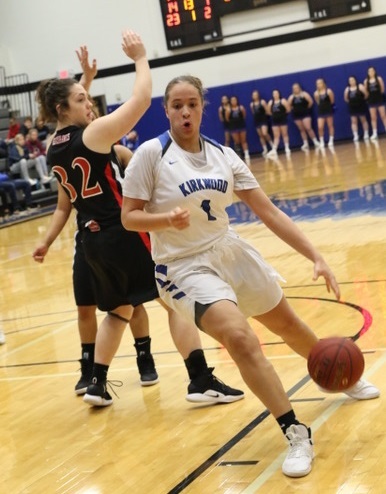 Kirkwood's focus now turns to Saturday's game at NIACC. The Trojans' only league loss was a 77-71 setback to Kirkwood on Jan. 19. They are currently on a six-game win streak, topping the 100-point barrier in four of the six games and scoring 99 in another. "Saturday will be an all-out war at NIACC," Muhl said. "They are really good and we are going to have to play really well to beat them." SOUTHEASTERN (44): Waller 4 1-1 9, Stewart 4 4-5 15, Benton 0 0-0 0, Morpurgo 2 0-0 5, Reyes 0 2-2 2, Trujillo 0 0-0 0, Caldwell 3 2-2 8, Shelby 1 0-0 3, Hudson 0 0-0 0, Finke 0 2-2 2, Joseph 0 0-0 0. Totals 14 11-12 44. KIRKWOOD (63): Jenkins 4 3-4 11, Gaston 1 0-0 3, Hurst 6 2-4 14, Bradford 8 1-2 17, Lipsey 3 0-0 8, Kennedy 2 0-0 5, Myers 1 0-0 2, Tomaszewski 1 0-0 2, Robinson 0 1-2 1, Mensen 0 0-0 0. Totals: 26 7-12 63. Halftime - Kirkwood 33, Southeastern 22. 3-point goals - Southeastern 5 (Stewart 3, Morpurgo, Shelby), Kirkwood 4 (Lipsey 2, Kennedy, Gaston).